"With Poncho joining Neil on guitar, the band developed a style that I believe allowed him to create his best music over the years. 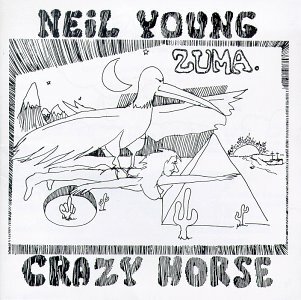 Previous Crazy Horse collaborations had power, but Zuma is the beginning of the balance of raw playing and a clean sound, featuring a perfectly balanced interplay between the two guitars. Similar to Big Star in the early seventies or Television in the late seventies, there is an amplified noise which doesn't let up on the energy, but is not overwhelming or excessive." "The better we get to know this supposed paradise, the clearer it gets that it ain't what we thought it could be to us. The line "but they built up with there bare hands / what we still can't do today" is the last, desperate defense, claiming that they were at least good workmen. The last word "today" definitely ends this dream and functions as a bridge to reality, where the narrator is longing for the mysterious "she". I've no idea what this She means in detail, a certain woman or "the woman of my dreams"." "I realized that Zuma was actually recorded before On The Beach, but the music on that and the previous two albums really I felt could have led to some level of depth in which (banish the thought) Neil might not even want to record music anymore. But, I had read a great interview Neil gave to Cameron Crowe in Rolling Stone Magazine; see it at Michal's Traces. So, there was some hope. Yet nothing, and I mean nothing prepared me for how this album would impact my life. Zuma came out a mere 6 months after TTN (that's what releasing an album recorded 2 years previously can do for you) and I think there was something in Neil's muse that compelled him to put this out. The result is one of the greatest albums ever by anyone."